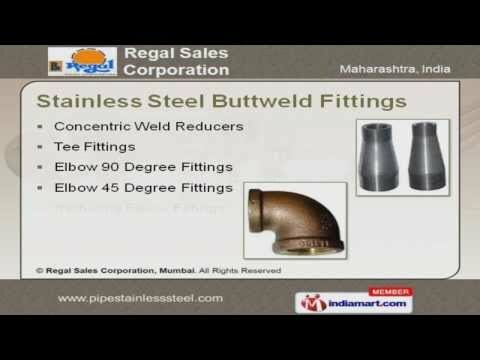 Welcome to Regal Sales Corporation, Manufacturer and Exporter of Industrial Stainless Steel Pipes and Pipe Fittings. The company was established in the year 1983. Our capacious warehouse and total customer satisfaction make us stand apart from also-rans. Timely deliveries, competitive pricing and ethical business practices help us to attain an enviable position in the industry. We offer a vast range of Stainless Steel Pipes, Inconel, Copper Products and ButtWeld Fittings. Our Stainless Steel Pipes and Flanges are extremely reliable. Stainless Steel Buttweld Fittings offered by us are best in the industry amongst others. Our Stainless Steel Socket Weld Fittings are available at industry leading prices. We also provide Inconel and Copper Products that are in huge demand across the global markets. Along with that we offer Non Ferrous Metals that are some of our best selling products.